Romantic cabin overlooking the beautiful grounds at Lambert’s Winery! 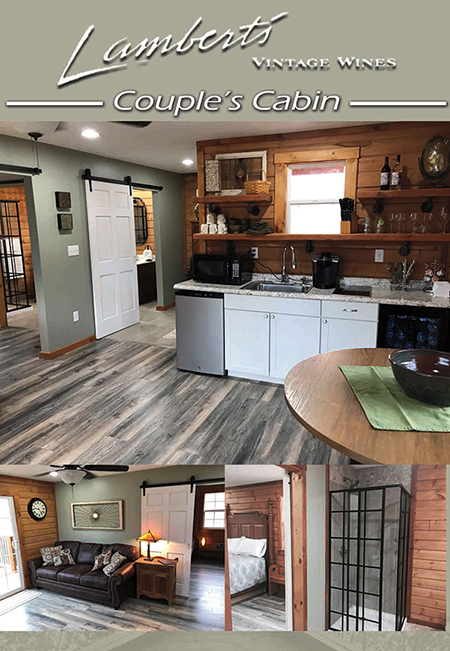 1-Bedroom cabin sleeps 2-4 people with a deluxe sleeper sofa in the living room allowing room for 2-couples. This quaint get-away contains many features including an electric fire-place, central air and heating, all towels and linens and a kitchenette stocked with the essentials: plates, glasses, silverware, a mini fridge, 2-burner stove-top, microwave, coffee maker and of course, a wine-cooler! Cozy up to the fireplace on the breezeway down at the winery or grill out and enjoy privacy with a glass of wine on your own back deck. With numerous unique and upgraded features, this is the perfect spot for a relaxing get-away!